A new facility aimed at ensuring the Highlands and islands benefit from growing market opportunities in data science has been launched in Inverness by Digital Economy Minister Kate Forbes. Its launch marks the latest expansion of publicly-funded innovation centre, The Data Lab (TDL), which already operates in Aberdeen, Edinburgh and Glasgow. Ms Forbes said the TDL hub initiative, known as TDL2, based at development agency Highlands and Islands Enterprise’s (HIE) headquarters, will “help develop the rural digital economy locally as well as nationally”. Working with HIE’s innovation and technology team in the Highland capital, a TDL2 staff member will focus on developing data science projects and skills in the area, in collaboration with Scottish universities and industry. Set up in 2014, TDL has now secured funding for its second phase of development, including up to £9.5 million from the Scottish Funding Council, £2.5m from Scottish Enterprise, £1m from the Scottish Government’s Digital Directorate and £500,000 from HIE. 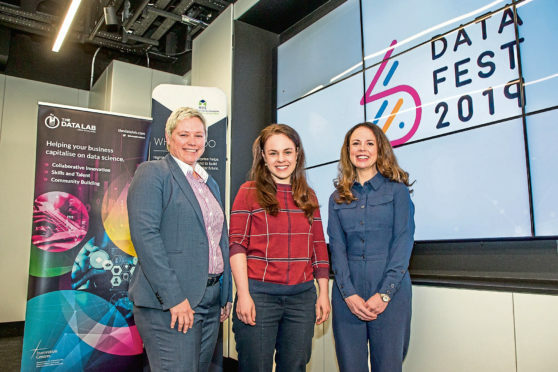 Ms Forbes announced the launch of the Inverness offshoot at the start of the DataFest Fringe festival, a week-long series of events at HIE’s An Lochran HQ focusing on data innovation. She said: “I am delighted to be launching the Highlands and Islands DataFest Fringe week. “It emphasises the importance of collaboration in order to maximise the opportunities of data innovation. “In particular, it is fantastic to be announcing the next phase of the new hub for The Data Lab here in Inverness which will help develop the rural digital economy locally as well as nationally. HIE’s senior development manager for digital, Theresa Swayne, added: “The opportunities from the data revolution are enormous and we want to ensure that the Highlands and islands is best placed to exploit them. TDL chief executive Gillian Docherty, who also attended yesterday’s launch, said: “We are very excited about the new TDL2 Hub in Inverness. TDL’s Aberdeen hub is based at Robert Gordon University.